Hawaii is the home of the earth’s largest volcano in the world. Take a look around to find out some great information on the current activity here on the island. Hawai`i Volcanoes National Park, established in 1916, displays the results of 70 million years of volcanism, migration, and evolution – processes that thrust a bare land from the sea and clothed it with complex and unique ecosystems, and a distinct human culture. The park encompasses 333,000 acres and ranges from sea level to the summit of the earth’s most massive volcano, Mauna Loa at 13,677 feet. Kilauea, the world’s most active volcano, offers scientists insights on the birth of the Hawaiian Islands and visitors views of dramatic volcanic landscapes. Over half of the park is designated wilderness and provides unique hiking and camping opportunities. Because the eruptions of Hawaiian volcanoes are gentler than those of most other volcanoes around the world, the edges of active vents are frequently accessible, allowing people to come pay their respects to Pele. The early Hawaiians revered her and made offerings to placate her wrath. Missionaries William Ellis and Asa Thurston visited Kilauea’s boiling lake of lava in 1823, the first Westerners to do so. Pele’s fiery lake was described in magazines of the day, and adventuresome travelers came to see it firsthand. Mark Twain, on seeing Kilauea in 1866, enthusiastically wrote, “Here was room for the imagination to work!? Lorrin Thurston, publisher of the Honolulu Pacific Commercial Advertiser at the turn of the century, loved to explore the volcano lands. Among his discoveries was a giant lava tube, formed when a river of hot lava cooled and crusted over and the still-molten interior continued to flow downhill. Eventually, the lava drained out, leaving a cave-like shell. The Thurston Lava Tube (Nahuku) is a major attraction on the Crater Rim Drive. In 1906, Thurston began a campaign to make this amazing area into a public park. His efforts were not effective until he was joined in 1912 by Dr. Thomas A. Jaggar, who came to the islands to establish and serve as director of the Hawaiian Volcano Observatory. Together, the two conservationists collared politicians, wrote editorials, and promoted the idea of making the volcanoes into a national park in what was then the territory of Hawai’i. On August 1, 1916, President Woodrow Wilson signed the country’s 13th national park into existence. It had taken 10 years, but the perseverance of Thurston and Jaggar paid off. At first, the park consisted of only the summits of Kilauea and Mauna Loa on Hawai’i and Haleakala on Maui. Eventually, Kilauea Caldera was added to the park, followed by the forests of Mauna Loa, the Ka’u Desert (the site of ancient warrior footprints set in ash), the rain forest of Ola’a, and the Kalapana archaeological area of the Puna/Ka’u Historic District. In 1961, Haleakala was made a separate national park. Today, Hawai’i Volcanoes National Park protects 377 square miles of the island’s volcanic wonders and is a refuge for surviving native plants and animals. In 1980, the United Nations Educational, Scientific, and Cultural organization (UNESCO) named Hawai’i Volcanoes National Park an International Biosphere Reserve because of its outstanding scenic and scientific values. The park was recognized for its important volcanic sites (including two of the world’s most active volcanoes); its volcanic island ecosystem, which preserves one of the largest significant ecosystems on the Hawaiian Islands; and its cultural and historic sites. The Biosphere Reserve program goals are to conserve the diversity of a designated site’s ecosystems and provide areas and facilities for international ecological and environmental research, education and training. Hawai’i Volcanoes National Park was named a World Heritage Site by UNESCO in 1982. World Heritage Sites recognize and protect areas around the globe that have outstanding natural, historical, and cultural values. It evolved from the idea that certain natural and cultural sites have “universal value? for all people. Mauna Loa erupts less frequently than does Kilauea, but it tends to produce a much greater volume of lava over a shorter period of time. Forty percent of Mauna Loa’s surface is covered by lava flows less than 1,000 years old. Nearly all of the Mauna Loa eruptions observed since the early 1800’s began at its summit caldera; during half of these, the activity subsequently shifted to either the northeast or the southwest rift zone. In addition to the summit and rift zones, the upper northwest flank of Mauna Loa has been the source of three eruptions in the last two centuries. 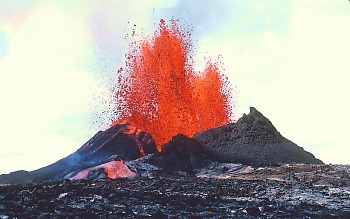 The largest of these, in 1859, produced a lava flow that reached the ocean north of Kiholo Bay on Hawaii’s west coast. Mauna Loa has also erupted from a submarine vent on its west flank in historic time. In 1877, a 1-day eruption took place beneath Kealakekua Bay within 1 mile of shore. This eruption produced turbulent water and floating blocks of lava, but it caused no injuries to onlookers who approached the area in canoes and other small boats. Between 1868 and 1950, lava flows from the southwest rift zone reached the ocean during five eruptions. Flows from four of these eruptions traveled to the sea in 3 to 48 hours. Since 1900, Mauna Loa has erupted 15 times, with eruptions lasting from a few hours to 145 days. After the 1950 eruption, Mauna Loa was quiet for 25 years. It reawakened with a 1-day summit eruption in 1975. The most recent eruption of Mauna Loa occurred in 1984. This eruption originated at the summit and, within a few hours, migrated to the northeast rift zone. The resulting lava flows advanced to within 4 miles of Hilo before the 3-week-long eruption ended. Similar short-duration eruptions of Mauna Loa’s northeast rift zone in 1852 and 1942 produced flows that came within about the same distance of Hilo. In 1855, a much longer-lived eruption fed a flow that stopped half a mile east of the upper Kaumana area on the western outskirts of modern Hilo. Lava invaded the present boundaries of Hilo in 1881, although the flow did not reach the shoreline, where the village of Hilo was located at that time. The 1881 flow underlies much of Kaumana and extends a half mile downslope of Komohana Road. Zone 1 on the lava flow hazard map for Mauna Loa includes the summit region and the recently active parts of the rift zones. Zone 2 consists of areas on both sides of the northeast and southwest rift zones. Since both of Mauna Loa’s rift zones form prominent ridges, all the areas in Zone 2 are downslope of potential eruption sites. About 20 percent of this area has been covered by lava in historical time, 5 percent since 1950. Zone 3 includes other areas on Mauna Loa in which the hazard is gradationally lower than in Zone 2. During the past 750 years, lava flows have covered about 15 to 20 percent of Zone 3 on Mauna Loa. These areas are less affected by rift activity than Zone 2, although the area of Zone 3 that lies on the northwest flank of the volcano is vulnerable to eruptions originating at vents on that flank. The 1859 lava flow covers 10 percent of this area. The part of Hilo that lies south of the Wailuku River is included in Zone 3 of Mauna Loa. Two areas on Mauna Loa are classed as Zone 6 because they are currently protected from lava flows by the local topography. One of these is the Naalehu area; the other is the slope southeast of the present summit caldera. 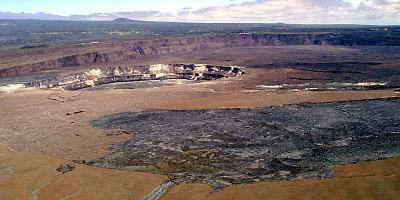 Kilauea is the youngest and southeastern most volcano on the Big Island of Hawai`i. 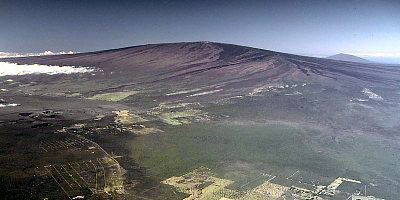 Topographically Kilauea appears as only a bulge on the southeastern flank of Mauna Loa, and so for many years Kilauea was thought to be a mere satellite of its giant neighbor, not a separate volcano. However, research over the past few decades shows clearly that Kilauea has its own magma-plumbing system, extending to the surface from more than 60 km deep in the earth. In fact, the summit of Kilauea lies on a curving line of volcanoes that includes Mauna Kea and Kohala and excludes Mauna Loa. In other words, Kilauea is to Mauna Kea as Lo`ihi is to Mauna Loa. Hawaiians used the word Kilauea only for the summit caldera, but earth scientists and, over time, popular usage have extended the name to include the entire volcano. Kilauea is the home of Pele, the Hawaiian volcano goddess. Hawaiian chants and oral traditions tell in veiled form of many eruptions fomented by an angry Pele before the first European, the missionary Rev. William Ellis, saw the summit in 1823. The caldera was the site of nearly continuous activity during the 19th century and the early part of this century. Since 1952 there have been 34 eruptions, and since January 1983 eruptive activity has been continuous along the east rift zone. All told, Kilauea ranks among the world’s most active volcanoes and may even top the list. The Pu`u `O`o-Kupaianaha eruption began on January 3, 1983. For the first six months, fissureserupted intermittently along the middle east rift zone from Napau Crater to Kalalua (eruptive episodes 1-3). In June 1983, the activity became localized at the Pu`u `O`o vent, which straddles the boundary of Hawai`i Volcanoes National Park. For the next three years (episodes 4-47), Pu`u `O`o erupted approximately every three to four weeks, usually for less than 24 hours at a time. These eruptive episodes were characterized by spectacular lava fountains that catapulted lava as high as 470 m above the vent. 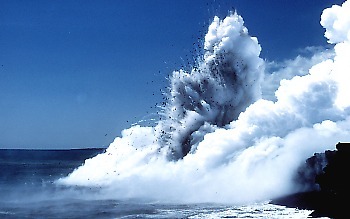 The high fountains produced mainly`a`a flows, the more viscous and crystalline of the two types of Hawaiian lava. `A`a flows from Pu`u `O`o were typically 3-5 m thick and advanced at speeds of 50-500 m/hr, picking up speed and narrowing on steep slopes. Because of the short duration of each eruptive episode, none of these flows reached the ocean or the coastal highway. The flows posed an immediate threat, however, to the sparsely populated Royal Gardens subdivision, located on a steep slope 6 km southeast of the vent. `A`a flows reached the subdivision in as little as 13 hrs during several eruptive episodes. They destroyed 16 houses in 1983 and 1984. Fallout from the towering lava fountains built a cinder-and-spatter cone 255 m high, over twice the height of any other cone on the east rift zone. The cone was strikingly asymmetric, because the prevailing trade winds caused most of the airborne fragments to pile up on the southwest side of the conduit. "I am very pleased with Jim and his staff for doing a great job in handling my rental in Waikoloa Village. I would recommend Hawaiian Dream Properties. Monthly reports and a all maintenance issue as well as personal service are a plus."